[R&D Policy in Korea (32)] Can North Korea sustain industrial growth? This is the 32nd in a series of articles introducing the Korean government’s R&D policies. Researchers at the Science & Technology Policy Institute will explain Korea’s R&D initiatives aimed at addressing major socioeconomic problems facing the nation. -- Ed. North Korea’s industrial infrastructure collapsed due to heavy floods in the mid-1990s. As a result, it suffered a long period of economic hardships. On top of this, it invited strong international sanctions by taking provocative military actions including the two nuclear tests conducted in 2006 and 2009, and firing of long-range ballistic missile in 2009. In response to economic isolation, North Korea has been seeking to reconstruct the collapsed industrial infrastructure and develop its industries. For instance, it implemented a “150-day battle” from April 2009 and a subsequent “100-day battle” to rebuild its industries including steel, chemistry and machinery. The North trumpeted the achievements made in some sectors, including steel, textile and fertilizer. But considering North Korea’s inefficient and outdated industrial facilities, the recent reconstruction achievements hardly seem sustainable in the long term. Given the low sustainability of North Korea’s industrial growth, its industrial development is expected to reach its limits soon, forcing the country to consider getting out of isolation and embracing openness and change. 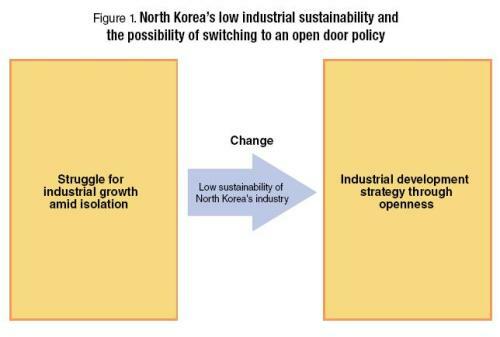 This paper will shed light on the achievements North Korea has attained through the recent reconstruction campaign and its industrial sustainability. In the 2010 joint New Year editorial, North Korea’s state media touted the completion of “juche iron” as one of its four major achievements in 2009. “Juche,” a watchword in North Korea’s ideology, means self-reliance. Juche iron thus refers to all the steel that North Korea produces with its own materials, manpower and technology. The completion of juche iron means the perfection of a “breakthrough” production method, called the juche method, in the “Samhwa Iron Process,” North Korea’s unique coke-free iron and steel manufacturing process. Iron ores produced in North Korea contain a large quantity of particles that hinders steel production. In order to solve this problem, North Korea developed the Samhwa Iron Process where granulated iron, limestone and anthracite are put together into a rotary kiln. This process produces pig iron with a high carbon content, which means it is brittle. So it has to be melted again to lower its carbon content using oxygen. North Korea used an electric furnace to melt pig iron. The problem with this method is that the Samwha pig iron does not melt easily in an electric furnace because of its high carbon content. One solution North Korea used to address this problem was to put scrap iron into the electric furnace to increase conductivity. However, the economic slump that started in the 1990s caused a shortage of scrap iron in North Korea. Importing scrap iron was also difficult due to a lack of hard currency. As a result, the country experienced difficulties in utilizing its granulated iron and producing steel through its proprietary Samhwa Process. In 2009, the Seongjin Steel Complex, also called Seonggang, developed a new process to melt carbon-rich Samhwa iron using an ultra high power electric furnace. This resolved the problem of scrap iron shortage and allowed North Korea to utilize its large iron ore deposits. North Korea touted this breakthrough, even saying it is more important than the success of the third nuclear test that it may undertake in the future. But in the process of developing the new method, several explosions occurred, suggesting it could be still unstable. At the same time, the new approach is highly likely to consume an enormous amount of electricity. Moreover, despite the breakthrough, North Korea’s steel production capacity is still limited, given that Samhwa iron only accounts for 32 percent of its steel output. In conclusion, the Samhwa Process is unlikely to spread throughout North Korea, given the country’s severe electricity shortage, the instability of the new production process and the limited steel output produced through it. The 2010 joint New Year editorial also cites the diffusion of computerized numerical control as one of the nation’s four major achievements in 2009. CNC refers to the automation of machine tools that enables a small number of workers to mass produce a standardized good. The technology is in line with North Korea’s efforts during the past several decades to modernize the machinery industry and to improve the productivity of its industry through automation. In 2009 the country publicized the application of CNC to more than 20 companies, including Pyongyang Textile Machinery Factory, Kanggye General Tractor Plant and Daean Heavy Machinery Complex, which resulted in huge output expansion. However, there are limits to diffusing CNC in North Korea. An expanded use of CNC requires high performance components whose exports to North Korea are strictly controlled. The country is unable to produce these parts on its own. On top of that, a stable supply of electricity is essential to using CNC machine tools for precision processing jobs. A shortage of electricity in North Korea will hinder the use of CNC tools. After all, the CNC technology uptake in the North will be limited given its inadequate infrastructure. Fertilizer is essential to increasing agricultural output. North Korea used to produce ammonia, the key intermediate for urea fertilizer, through high-temperature reactions between nitrogen gas and hydrogen gas in the air. But the country gave up on this method due to excessive consumption of power. As a result, it has been unable to produce urea fertilizer. Such a lack of fertilizer has contributed to an aggravating food shortage in North Korea. Currently, its rice output falls short of demand by more than 1 million tons a year. Recently, North Korea proudly announced that the Namhung Youth Chemical Complex succeeded in producing fertilizer through the gasification of anthracite. This process gasifies hard coal, which is abundant in the North, to decompose steam and air and combine the resultant nitrogen and hydrogen into ammonia. In North Korea, a coal gasification factory was already constructed by Japan’s Noguchi zaibatsu before Korea’s liberation from the Japanese colonial rule in 1945. This indicates North Korea had the technology, although outdated, to turn coal into gas. It also suggests the possibility of North Korea continuing to produce urea fertilizer through coal gasification. But given the fact that anthracite gasification relies on the use of nitrogen in the atmosphere, it can only produce a limited amount of ammonia. Moreover it is likely to take a considerable period of time to stabilize the production facilities. Considering these factors, the possibility cannot be ruled out that fertilizer production will continue to falter in North Korea for the time being. In North Korea, the vinalon fabric carries enormous significance as it enabled the provision of clothing to the people and the establishment of the organic chemical industry. For this reason, North Korea mobilized all the resources available to build the February 8 Vinalon Complex in 1961. The complex, however, stopped production in 1994 due to the country’s economic hardship and lack of raw materials. Operation could not be resumed due to the deterioration of the facilities and shortage of parts. But the plant reportedly began production again in early February 2010 after two years of reconstruction efforts. It was reported North Korea automated the plant by applying CNC technology. Recently, the North Korean leader Kim Jong-il celebrated the resumption of vinalon production. He emphasized the importance of ensuring a smooth supply of electricity and anthracite and infrastructural support to sustain vinalon production. But the supply of anthracite to vinalon production will likely fall short of demand in light of the fact that North Korea’s current coal production amount stands at the 50 percent level of the 1990s. Furthermore, hard coal is also in high demand for various industries including chemical, steel and electricity generation. The country’s electricity shortage is another critical factor that hinders the vinalon plant from running at full capacity. We have reviewed North Korea’s recent industrial reconstruction efforts. Can the achievements it has made be sustained and further developed in the future? To provide an answer, we will look into the characteristics of North Korea’s industrial structure and the status of its resources and energy supply. First of all, North Korea’s industry depends heavily on coal. For example, coal is used as the most essential raw material for production of basic materials used in the chemical industry. In the steel industry, it is not only the fuel that fires the furnace but the raw material used in the steel-making process. Furthermore, when rivers freeze in winter reducing the electricity generation of hydro-electric power plants, coal is used to fuel thermal power stations. This heavy reliance on coal derives from the juche ideology which requires all industries to meet 60 to 70 percent of their demand for raw materials and resources with those available in North Korea. Another important feature of the North Korean industry is its high energy intensity. For instance, the steel industry still uses the rotary kiln, which consumes two to three times more energy than the ordinary furnace. In order to get ethylene, which can be easily obtained through petroleum refining, North Korea relies on a method that requires heat above 2,000 degrees Celsius. Following the so-called “March of Hardship” that North Korea experienced in the mid-1990s, its energy supply fell below one third of the previous level. In particular, crude oil imports dropped from 4 million tons a year to 560,000 tons, a drop of as much as 86 percent. As a result, coal began to account for more than 50 percent of the energy supply in North Korea. But coal production fell from 32 million tons a year before 1990 to 15 million tons in 2007, with the downward trend continuing. Moreover, since extracted coal only meets 30 percent of the demand in the country, the coal supply to each industry dropped considerably. For instance, the metal industry received almost no supply of hard coal in 2005. The situation was no better for the chemical industry. Its share was only 1/40 of the maximum level in the past. North Korea’s lack of foreign currency makes it difficult to import coal, exacerbating the shortage of coal supply. Now let’s turn to the status of electricity supply in North Korea. The country’s hydroelectric power generation capacity fell from 1.7 million kw in 1995 to 1.24 million kw in 2005. Its thermal power generation capacity also fell from 0.81 million kw in 1995 to 0.3 million kw in the early 2000s. In recent years, it rebounded to 0.6-0.7 million kw. Compared with the 1990s, North Korea suffered a sharp drop in power generation. However, in recent years, power production has stabilized. But in the long term, power production in North Korea is expected to drop further. Hydroelectric power generation has been on the decline due to deterioration of generating equipment, an insufficient quantity of water and frequent accidents. Its thermal power stations also suffer deterioration of plant facilities, an inefficient supply of coal and a lack of technical expertise. North Korea may have rebuilt its industries to some degree through the recent reconstruction initiatives. But in the long run, the prospect for sustained industrial development appears dim due to its heavy reliance on coal, high energy intensity, inefficient industrial structure, and a shortage in coal and electricity supply. North Korea’s low industrial sustainability suggests a high possibility of the country seeking to get out of isolation and open up its economy. The South Korean government would do well to heed this possibility and make thorough preparations for it. This paper will make policy suggestions for two possible situations -- when North Korea maintains the status quo and when North Korea adopts an open-door policy. First, if the North chooses to retain its current policy, the Seoul government needs to invest time and energy to figure out the possibility of North Korea changing course. To this end, Seoul needs to step up efforts to monitor and analyze the status of the North’s energy, resources and industries. More specifically, it needs to focus on the power generation trend; the production and transportation of coal; the supply of electricity and coal by region and season; demand for power and coal by industry; and the operation status of major industries. 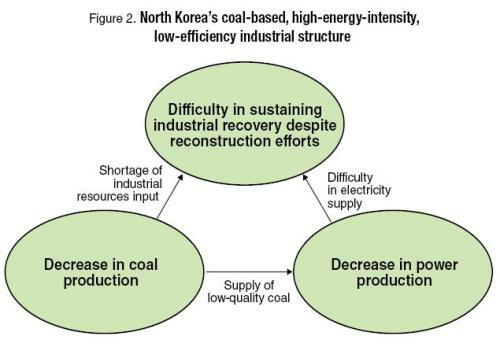 Lastly, it is necessary to analyze the gross output of coal and electricity in North Korea and demand for these resources by its key industries to determine if the country’s industrial growth is sustainable. Then, if North Korea decides to change course and open up, the Seoul government needs to consider supporting its industrialization for mutual benefits and prosperity. Specifically, the South can promote a cooperation program focused on North Korea’s energy production facilities and technology. The program can include direct supply of crude oil and electricity, upgrading of the North’s outdated energy production facilities and training of its energy officials. At the same time, Seoul officials can consider reinforcing cooperation in areas where synergy can be created by combining the North’s human resources with the South’s capital and technology. Such cooperation may be possible through the South’s investment in the North’s light industries. Corporations from the South may also attempt to explore new markets for North Korea’s unique technologies such as vinalon. Next, we suggest the establishment of an Inter-Korean Science and Technology Cooperation Center to link technology and industry of the two Koreas. This is similar to the International Science & Technology Center established by Western countries following the breakup of the Soviet Union. It will facilitate the denuclearization of North Korea and help its skilled workers adapt to the market economics. In addition, when North Korea opens its economy, corporations from South Korea need to be able to access the North’s technologies and manpower. The center will be able to play a role for the southern firms. -- Kim Jong-seon is currently leader of the Inter-Korean Cooperation Team at the Science and Technology Policy Institute. He obtained his Ph.D. in chemical engineering at the Korea Advanced Institute of Science and Technology in 2000. 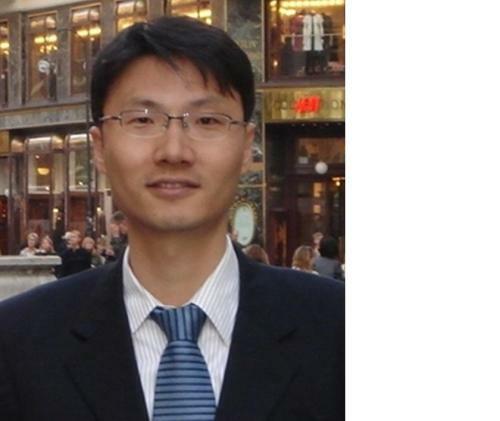 His main research areas include promotional policy for small and medium-sized enterprises and companies of middle standing, and North Korea‘s science and technology and inter-Korean industry and science cooperation. -- He can be reached at jskim@stepi.re.kr.